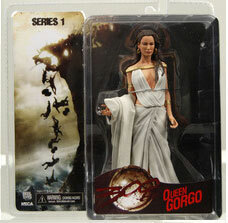 Description Of Item: 300 - Queen Gorgo. This series come from the highly anticipated film coming out on the Spartan War drama based on Frank Miller's graphic novel. These highly detailed figures come with alternate heads and movie accurate accessories.